Spend the 10th (Mon) exploring nature at Yellowstone National Park. 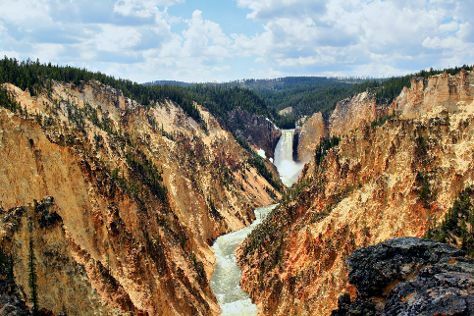 There's much more to do: take in breathtaking views at Grand Canyon of the Yellowstone, witness a stunning natural landmark at Old Faithful, contemplate the waterfront views at Yellowstone Lake, and explore the striking landscape at Gibbon Falls. For reviews, more things to do, photos, and other tourist information, you can read our Yellowstone National Park trip planner . Saginaw to Yellowstone National Park is an approximately 16-hour flight. You can also drive. Due to the time zone difference, you'll gain 2 hours traveling from Saginaw to Yellowstone National Park. Traveling from Saginaw in June, expect nights in Yellowstone National Park to be much colder, around 34°F, while days are slightly colder, around 66°F. Wrap up your sightseeing on the 12th (Wed) early enough to travel to Glacier National Park. Go for a jaunt from Glacier National Park to West Glacier to see River Rafting & Tubing about 48 minutes away. Spend the 14th (Fri) exploring nature at Waterton-Glacier International Peace Park. There's much more to do: take a memorable drive along Going-to-the-Sun Road, trek along Iceberg Lake Trail, appreciate the views at Logan Pass, and stroll through Highline Trail. To plan Glacier National Park vacation without wasting time, ask Inspirock to design an itinerary. Traveling by combination of car, flight, and taxi from Yellowstone National Park to Glacier National Park takes 7.5 hours. Alternatively, you can drive; or do a combination of taxi and flight. Prepare for somewhat warmer weather when traveling from Yellowstone National Park in June: high temperatures in Glacier National Park hover around 75°F and lows are around 45°F. Wrap up your sightseeing on the 16th (Sun) early enough to travel back home.